The Q 3020i builds on the success of its multi award winning predecessor. The Q 3020i speakers can be shelf-mounted on compliant, pre-fitted rubber feet, stand-mounted or wall-mounted on optional, dedicated stands and brackets ensuring the Q 3020i fit seamlessly and fill your chosen listening room with bold, beautiful sound. 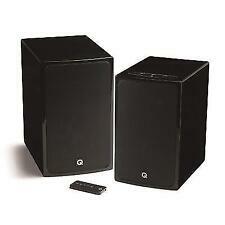 For sale is a pair of Q Acoustics Concept 20 Bookshelf Speakers in Gloss Black. (2) 3020i Bookshelf Speakers (Arctic White). 3020i Features They utilize Point-to-Point™ (P2P) bracing to improve focus of the stereo image, have slightly taller and deeper cabinets that allow an extended low-frequency response from the ported design, and a high-frequency driver unit with the tweeters decoupled from the baffles. 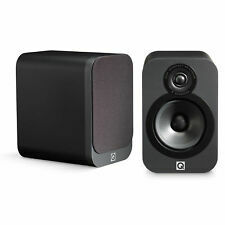 (2) Q Acoustics 3020 Bookshelf Speakers (Graphite). Q Acoustics 3020 Bookshelf Speaker Features One of the best bookshelf speakers! In addition, it boasts a larger 125mm drive unit, with the new Aramid Fibre/Paper cone material. (1) Q M4 Hi-Fi Soundbar. M4 Soundbar Specifications Due to energy regulations the soundbar will automatically enter standby mode after 20 minutes of non-use. Enjoy a genuine cinematic experience with the M4. The 3010 can also be stand or wall mounted, using the dedicated 3000ST stand or 3000WB wall bracket. Surpassing its sibling the 2010i; the 'Ultra Compact' 3010 builds upon its outstanding performance and adds another level of excellence. The new BT3 isn’t a jazzed up iPod dock or modified table radios in disguise. As stated above, the BT3 looks and sounds like a pair of genuine, superior quality hi-fi loudspeakers, for the very obvious and simple reason; that’s precisely what they are. Due to energy regulations the soundbar will automatically enter standby mode after 20 minutes of non-use. A more compact soundbar than its big brothers, the M4 and M4i. (1) Lithium Battery, (3V, CR2025). 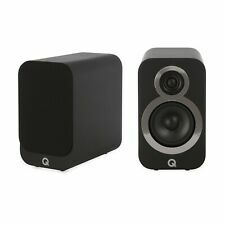 (2) Q Acoustics 3020 Bookshelf Speakers (Gloss Black). Q Acoustics 3020 Bookshelf Speaker Features This all contributes to an undistorted sound like no other. Q Acoustics 3020 Bookshelf / Standmount Speaker. 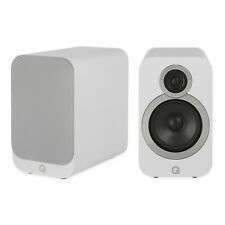 Q Acoustics 3020 Bookshelf Speakers Features Q Acoustics 3020 Bookshelf / Standmount Speaker. One of the best bookshelf speakers! In addition, it boasts a larger 125mm drive unit, with the new Aramid Fibre/Paper cone material. Winner of the "What Hi-Fi?". M2 Soundbase Features This compact soundbase was made for compact spaces, making it incredibly versatile. The All in One Soundbase for TV, Movies & Music. 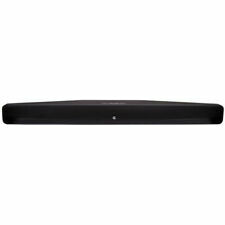 (1) Q Acoustics M2 Soundbar. 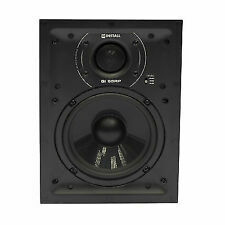 (1) 3090Ci Centre Speaker. 3090Ci Features With the new high frequency driver unit, the Q 3090Ci benefits from a decoupled tweeter which ensures the vibrations from the woofer, which can impair the performance of the tweeter, are isolated allowing the tweeter to perform with dramatically reduced interference, resulting in a purer sound. Q Acoustics Concept 20 Bookshelf Speaker Features Q Acoustics Concept 20 Bookshelf Speakers. Q Acoustics Concept 20 Speakers. The beautifully finished, compact and eminently affordable Concept 20 loudspeaker is designed for music lovers who wish to enjoy performances at their very highest quality. (2) Q Acoustics 3010 Bookshelf Speakers (Gloss Black). Q Acoustics 3010 Bookshelf Speaker Features Outperforming its sibling, the 2010i, our ultra-compact 3010 bookshelf speakers build upon the 2010i's outstanding performance to take excellence to a whole other level. (2) 3010i Bookshelf Speakers (Arctic White). 3010i Features Q Acoustics Warranty Policy. Shelf or stand mount for versatile design. Sockets are deep enough to accept 4mm (0.16in.). banana plugs. Sensitivity (2.83V @ 1m): 86dB. (2) 3010i Bookshelf Speakers (Carbon Black). 3010i Features Q Acoustics Warranty Policy. Shelf or stand mount for versatile design. Sockets are deep enough to accept 4mm (0.16in.). banana plugs. Sensitivity (2.83V @ 1m): 86dB. The Q 3010i speakers can be shelf-mounted on compliant, pre-fitted rubber feet or stand-mounted or wall-mounted on optional, dedicated stands and brackets. 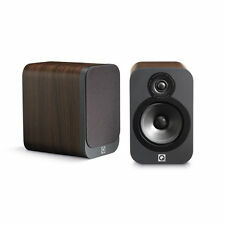 2 x 3010i Bookshelf Speakers (Walnut). 3010i Bookshelf Speaker Features. The powerful 150W Class D ampli­fier drives a 200mm low frequency driver, which is as capable of faithfully reproducing the speed and ‘twang’ of a double bass as it is the prolonged, earth moving rumble of a ‘block buster’ explosion. (2) Concept 40 Floorstanding Speakers (Gloss White). Concept 40 Floorstanding Speaker Features 2-Way Reflex with Double Woofer. (2) Speaker Grills. Experience the Concept 40. The low-distortion drive units incorporate powerful oversized magnets to ensure wide dynamics and an ultra-fast transient response. (2) 3050i Floorstanding Speakers (Graphite Grey). HPE™ (Helmholtz Pressure Equalizer) technology designed to convert pressure to velocity and reduce the overall pressure gradient within the speaker enclosure, has been applied to the Q 3050i to reduce cabinet resonance. Q Acoustics Concept Center Channel Speaker. (1) Concept Center Speaker (Gloss White). Alternative locations for positioning the speaker in the listening room are catered for by providing a foam bung which can be inserted in the rear-mounted reflex port modifying the bass response to suit positioning against a rear wall or in AV furniture. HPE™ (Helmholtz Pressure Equalizer) technology designed to convert pressure to velocity and reduce the overall pressure gradient within the speaker enclosure, has been applied to the Q 3050i to reduce cabinet resonance. Q Acoustics Concept 20 Bookshelf Speaker Features Q Acoustics Concept 20 Bookshelf Speakers. (2) Speaker Grills. They were designed for music lovers wanting to enjoy performances at their very highest quality. Q Acoustics 3070 Subwoofer Features 3070 Subwoofer. 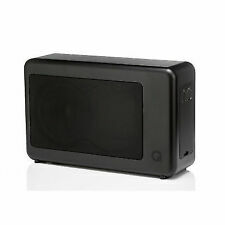 Q Acoustics 3070 Subwoofer. Special Exceptions Product must be in resalable condition. This prevents that energy causing cabinet resonance which would color and degrade the speaker's musical output. When this new cabinet design is combined with the Concept 20's advanced, high dynamic, low distortion drive units, the result is a loudspeaker which, at its price, is nothing short of sensational. 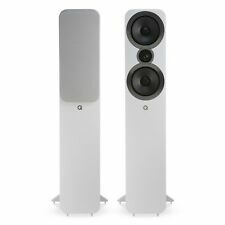 (2) 3050 Floorstanding Speakers (Gloss White). Q Acoustics 3050 Floorstanding Speakers Features 3050 Floorstanding Speaker. 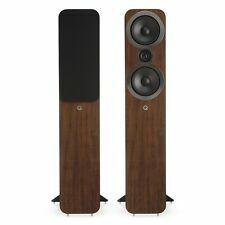 Q Acoustics 3050 Floorstanding Speaker. (2) Magnetic Speaker Grills. (2) Floor Outrigger Stands. Q Acoustics 3090c Center Channel Speaker. The 3090C is a center channel speaker with two of the new 100mm, Aramid Fibre/Paper cone bass drivers and the. The 3090C Center as with the rest of the 3000 range, benefits from new & improved driver units and revised bracing. (2) Q Acoustics BT3 Active Bookshelf Bluetooth Speakers (Gloss Black) (1 x Active, 1 x Passive). Q Acoustics BT3 Active Bookshelf Bluetooth Speaker Features The new BT3 isn’t a jazzed up iPod dock or modified table radios in disguise. The Q 3020i builds on the success of its multi award winning predecessor. 2 x 3020i Bookshelf Speakers Graphite. 3020i Bookshelf Speaker Highlights The Q 3020i speakers can be shelf-mounted on compliant, pre-fitted rubber feet, stand-mounted or wall-mounted on optional, dedicated stands and brackets ensuring the Q 3020i fit seamlessly and fill your chosen listening room with bold, beautiful sound. 3000 Series Speaker Stand. (8) Speaker Mounting Bolts. The 3000ST speaker stand is designed specifically for the 3010 and 3020 loudspeakers. (8) Floor Spikes. (8) Floor Spike Covers. (1) User Manual. 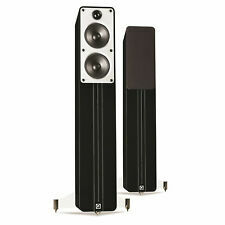 Q Acoustics 3050 Floorstanding Speakers Features 3050 Floorstanding Speaker. 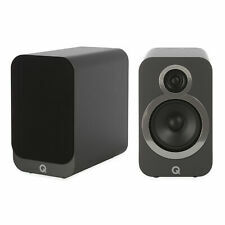 Q Acoustics 3050 Floorstanding Speaker. One of the best floor standing Speakers you can buy. Performance is further enhanced, both sonically and aesthetically, by its integral steel 'outrigger' plinth with floor spikes. 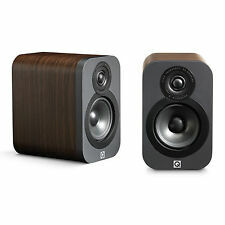 (2) Q Acoustics 3010 Bookshelf Speakers (Graphite). Q Acoustics 3010 Bookshelf Speaker Features Q Acoustics 3010 Bookshelf Speakers. 3010 Compact Bookshelf Speaker. The 3010 can also be stand or wall mounted, using the dedicated 3000ST stand or 3000WB wall bracket. 3020 Bookshelf Speaker Specifications One of the best bookshelf speakers! In addition, it boasts a larger 125mm drive unit, with the new Aramid Fibre/Paper cone material. Q Acoustics 3020 Bookshelf / Standmount Speaker. The 3090C Center as with the rest of the 3000 range, benefits from new & improved driver units and revised bracing cabinets. This is the ultimate centre channel in the Q Acoustics range. 3090c Center Channel Speaker Highlights. Q Acoustics 3050 Floorstanding Speaker Specifications 3050 Floorstanding Speaker. One of the best floor standing Speakers you can buy. Performance is further enhanced, both sonically and aesthetically, by its integral steel 'outrigger' plinth with floor spikes. Enclosure: 2-way reflex. Bass Unit: 125m. Treble Unit: 25mm. Ideal for larger rooms, the 3020s bring greater dynamic realism and are easy to drive, making them ideal for less powerful amplifiers. Bass Unit: Concept 20: 5" Concept Center Channel: 2 x 4". Frequency Response: Concept 20: ( /- 3 dB) 64Hz - 22kHz Concept Center Channel: ( /- 3 dB) 75Hz - 22kHz. The astonishing ability of the Concept 20 is best revealed when the loudspeakers are used in conjunction with the matching Concept 20 Speaker Stands which, to optimise performance, boasts a GelcoreTM layer in its top plate. (1) Q Acoustics 6.5” Stereo Speaker. Q Acoustics 6.5” In-Ceiling Stereo Speaker Features Tweeter: Swivel. Experience the 6.5" In Ceiling Stereo Speaker. This was practically impossible before due to the impractical nature of having the speakers dotted around in each room. Tweeter: Swivel. Power handling (program): 15-60W. Product must be in resalable condition. Cutout Size: 203mm. The grilles attach via magnets.